Suzuki Motorcycle India reached a landmark as it rolled out the four millionth two-wheeler from its facility in Gurugram, Haryana. 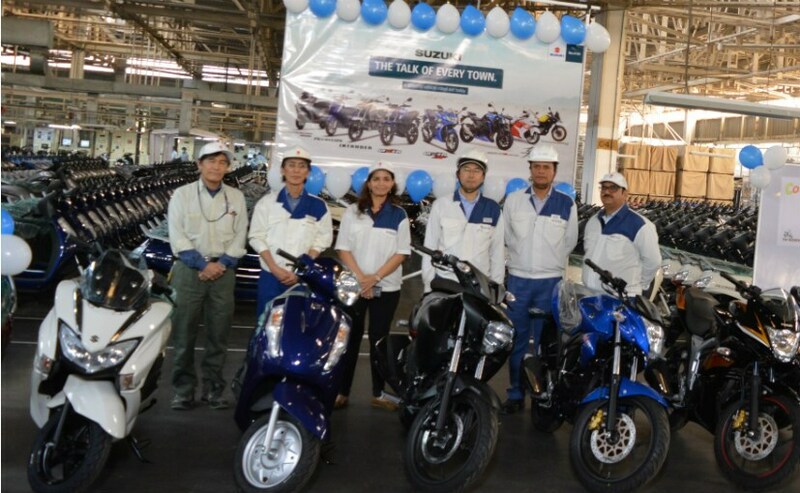 Suzuki Motorcycle India reached a landmark record in India with the 4 millionth two-wheeler rolling off the company's factory in Gurugram, Haryana. The production milestone paves the way for Suzuki's target of achieving one million volume sales and doubling its market share by 2020, in India. The company has achieved this milestone in 12 years of operations in India, starting in 2006. It has a pan India presence with 521 dealerships at present. Celebrating company's landmark moment, Satoshi Uchida, Managing Director, SMIPL said, "We are delighted to roll out the four millionth vehicle and are thankful to our customers who have shown immense trust in our products. This is a testimony of our commitment to India and we wish to achieve many such milestones in the future. With this landmark, we are a step closer to achieving our sales target of 7.5 lakh units by the end of the current financial year. We thank our valued customers, business partners, associates, and all my colleagues for this remarkable feat." The company has 16 models under its portfolio in India. The big chunk of volumes is driven by the Access 125 and the Burgman Street along with the Gixxer series and Intruder 155. Suzuki Motorcycle India also retails high capacity motorcycles in India such as the Hayabusa, GSX-R1000R, GSX-S750, V-Strom 650XT and its RM-Z series of dirt and off-road motorcycles. Suzuki Motorcycle India also exports made in India products to over 30 countries across the world.